I am writing this holiday blog from Antigua, I hope that was a non smug way of telling you I am on my hols again, this time in the Caribbean for an autumn getaway. Whilst packing to go away the beauty portion of the pack was a no brainer. 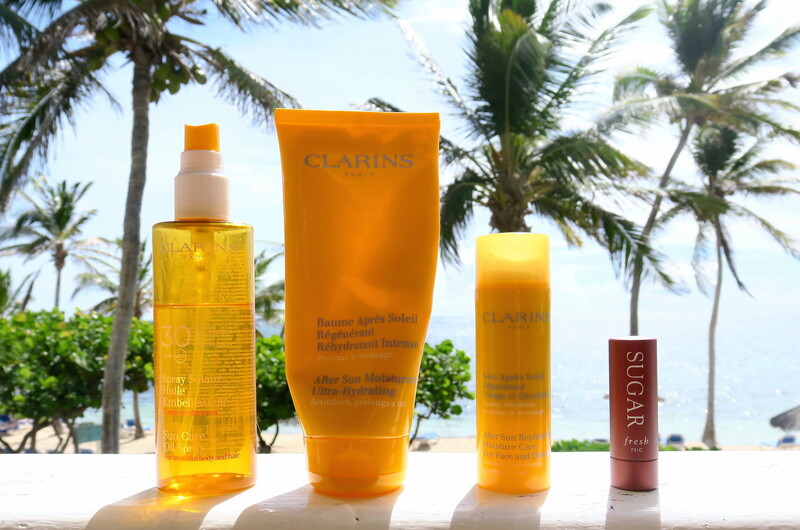 I have now edited my holiday beauty and skincare down to the perfect combination of products. Not going away for winter sun? Then book marked this page for next season! Hair often gets neglected when you are on your holidays and rightly so! Ain’t nobody got time for blowdries, flat irons or any sort of a high maintenance hair regime when there are poolside cocktails to be drunk. For daytime in the sun I liberally spritz on my fav haircare product Bumble & bumble Invisible Oil Primer and scrap my hair back into a top knot or get my sister to braid it. Usually by dinner time the sea breeze gives me soft beachywaves. If I fancy something a little more slick I reach for the gel! I never though a gel product would see the inside of my my beauty bag post 90’s but for those super slick wet-look hairstyles this Phyto Sculpting Gel is my go to for low maintenance chic hair styles. The formula contains collagen to hydrate and block UV rays too. 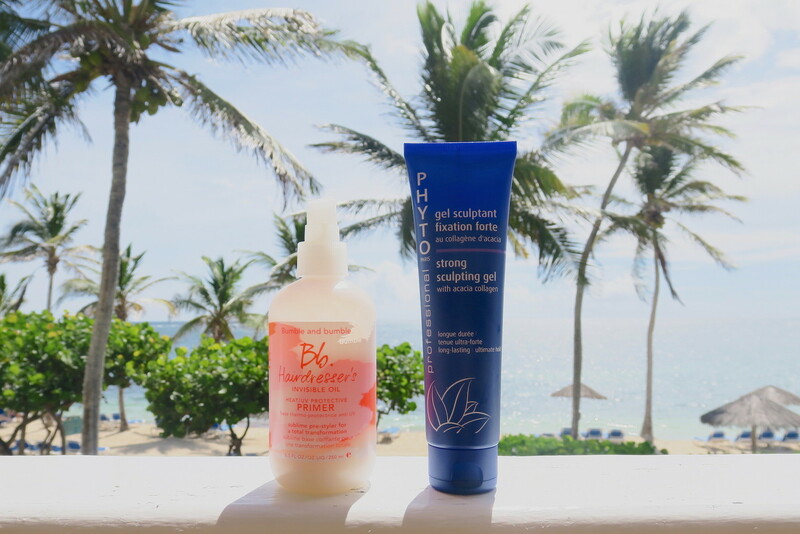 My holiday moisturiser plays second fiddle to my aftersun moisturiser (deets below). 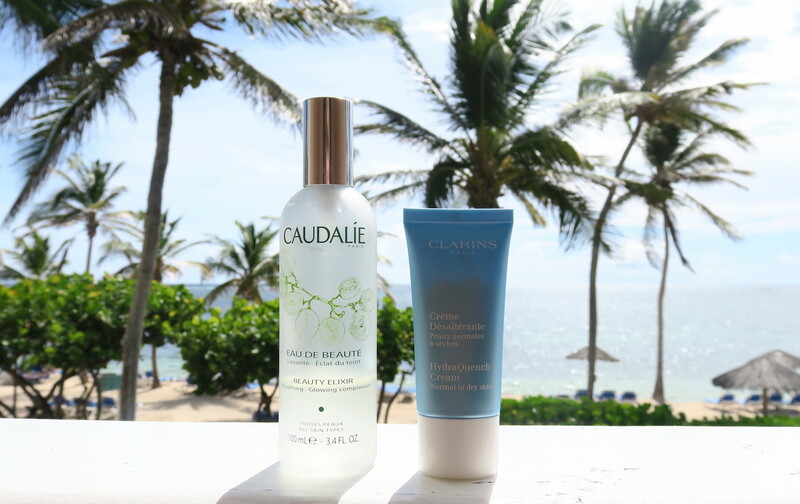 I use my Caudalie Beauty Elixir and Clarins Hydraquench Cream religiously throughout the flight to avoid looking like a dried up prune upon landing. Caudalie Beauty Elixir is a staple in makeup artists kits worldwide. The smell is divine and relaxing and totally unique. Shake before spritzing to mix up the potion. This year Clarins intro’ed me to their suncare line and I’ve never looked back with the exception of some La Roche Posay Anthelios Protective Oil 50+ when things are really heating up. 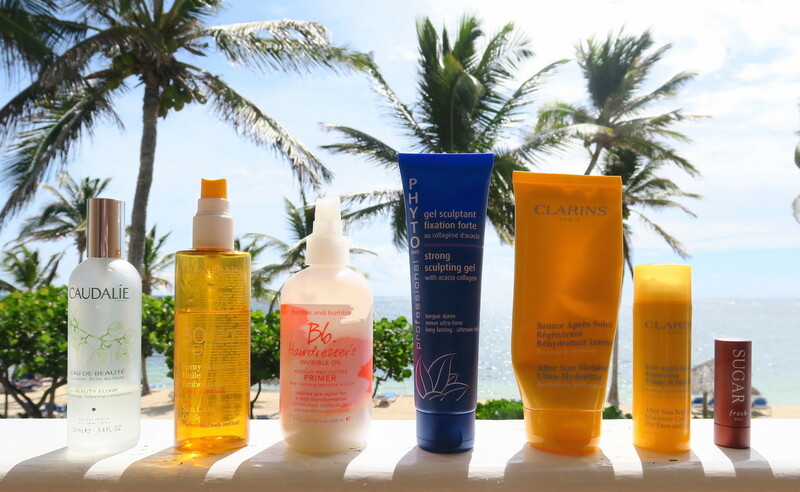 My favourite is the Clarins Suncare Oil Spray UVB/UVA 30. Their sunblock oils are moisturising and have great levels of protection and stay in place so I get an even tan. The After Sun Ultra-Hydrating Moisturiser for body and face extends my tan and keeps my limbs hydrated to avoid dryness post tanning. My tan never lasted until I started using these! Rain or shine a lipbalm is always with me. I’m addicted to the Fresh’s Sugar Lip balm treatment with 15SPF. These are the ultimate luxury for your lips and feels like silk when applying. The original smells sweet and a bit lemony. Sublime! My holiday perfume choice was a no-brainer. I have fallen head over heels for the refined and sophisticated juices of Miller Harris, particularly this very fresh and androgynous scent from their Editions Collection. L’Eau Magnetic was created with the chaos of ocean in mind. Italian Bergamot, ripe citron and pink berries, with a hint of Reunion Island vanilla bourbon and Venezuelan Tonka bean makes this the perfect scent for my Caribbean island getaway. Divine. Click the bold words to shop this post.